Peter Murray was born in Orange in about 1883. He volunteered to serve in WWI on 28 September 1915 and proceeded to Armidale training camp. 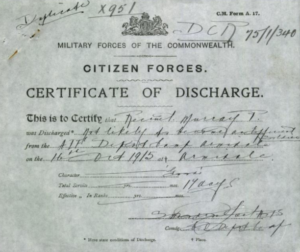 Peter served for just 17 days; he was discharged from the AIF on 16 October. His service records state “not likely to become an efficient soldier”. 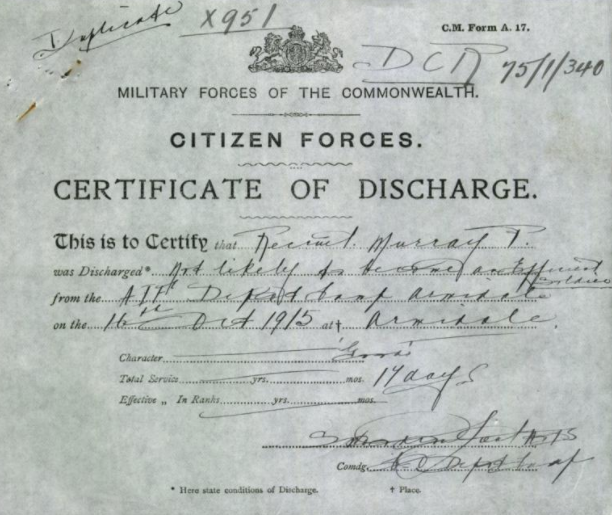 Peter Murray’s certificate of discharge. Image courtesy National Archives of Australia. It’d be interesting to know what attributes Peter Murray lacked or what they noticed in him to know he was unlikely to become an efficient soldier. Yes, we agree! Unfortunately we were unable to find any further details about Peter’s life. It was certainly more common earlier in the war for a soldier to be discharged for being “unlikely to become an efficient soldier.” As the war dragged on and casualty numbers increased, less men were discharged for this reason. This entry was posted on December 23rd, 2017.